By 1933, the place was called Linde place. After the festivities of the 450th anniversary of the Reformer in November of that year the renaming took place at the request of the Protestant church. Despite the tensions that existed since the takeover by the National Socialists with the ecclesiastical institutions, the then minister Herbert Fuchs tried to have a good relationship and compared Hitler in his speech, even in its meaning with Martin Luther.Ursprünglich stood here in the square and a certain extent on the Pfinz along in Wilhelm, today's Martin Luther Strasse, old lime trees. After them was this little piazza, which was really only emerged with the establishment of the seawall at the Pfinz named. The old lime trees are still clearly visible on the figure by an oil painting of Margot Erlenwein-Semmler at the left half of the image. Among the high branches of the trees along the river was already in the summer of 1925, Marie Scheidt with their ice cream truck. She drove temporarily even with a small cart with homemade wooden troughs, in the Blockice were inserted to cool and filled with the sweet delicacy copper kettle was placed through the streets. So it was in the village "Eismarie", one of the oldest establishments of its kind in the region. The family running the grandmother of tradition with a firm footing to continue today. 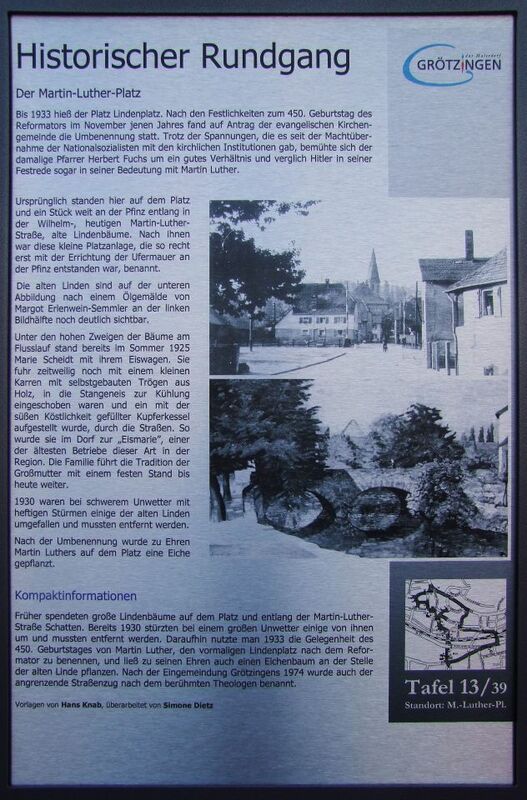 1930 were toppled during heavy storms with heavy storms some of the old Linden and had to be removed. After renaming an oak tree was planted in honor of Martin Luther on the court.